The picture is dark but I wanted you to see the curly stamens. I'm horribly repetitive. It's because of the seasons. I'll blame it on them entirely. Every year come spring I go and look at a hawthorn tree. Not any old tree; the same one every year. Come autumn, when the haws are almost overwhelming in their colour and quantity I go and see a different tree. Absurd but . . it just happens. I head back to the familiar. It's wonderfully reassuring. It may be that what I saw in the spring, or last year, or the year before is still there. Or it might not be. Either way it helps me feel rooted, part of the year. My input is zilch. But it confirms I belong. 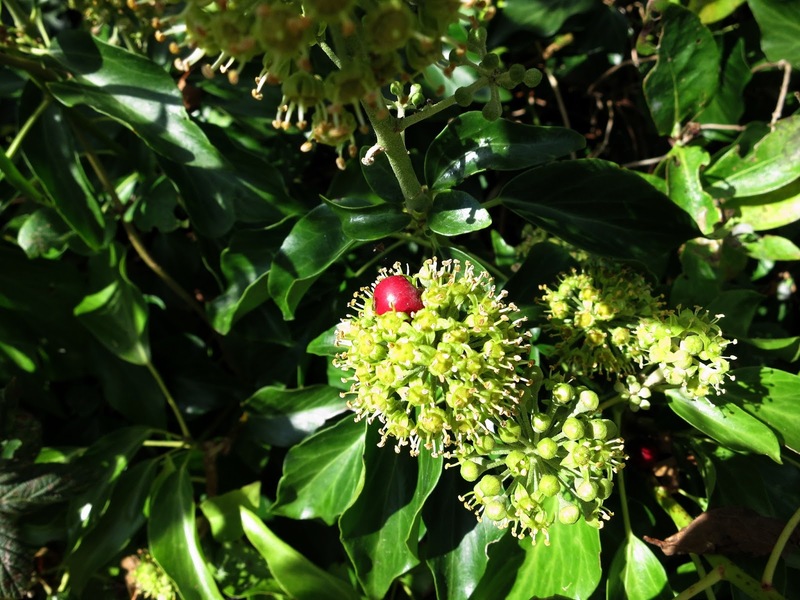 Ivy flowers with a fallen haw. 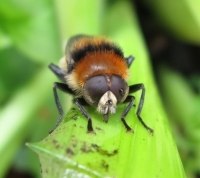 Unconventional as flowers go but beloved of hoverflies. Perhaps I also feel a little smug. I could stop people and say 'there were rose-hips here last year. Do you see, there are only three this year and even they are buried in the undergrowth'. It would be getting my own back from all those who stop to ask me what I'm looking at and are disappointed when I say 'the back of this leaf'. The rose-hips I visit really are missing this year. And, oddly, where there's a gap between hawthorn trees the one on the left has few berries but the one on the right has just as many as usual. Esoteric and completely pointless knowledge! 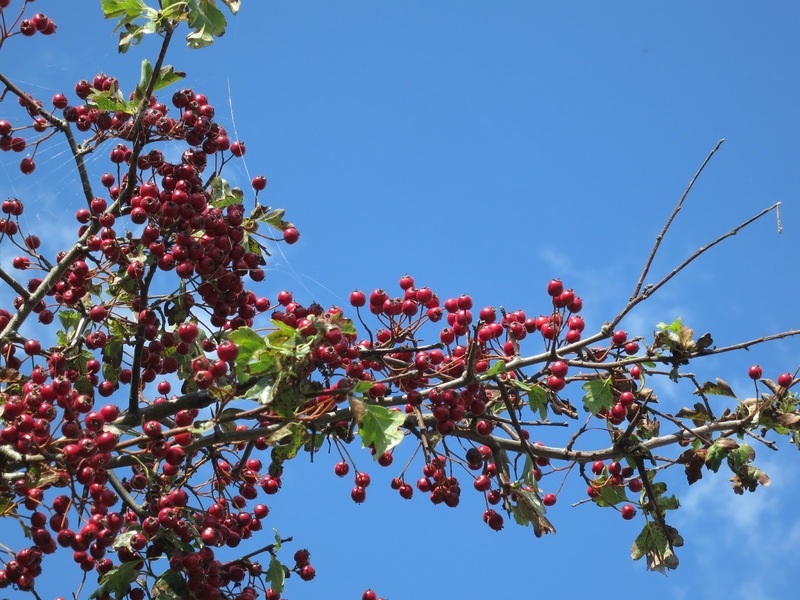 Haws - the fruit of hawthorn trees. Still in profusion on 25th September. A sharp wind at this time of year can easily transform the view. I was looking for hoverflies. I'm always looking for hoverflies! And I was eating blackberries as I went. 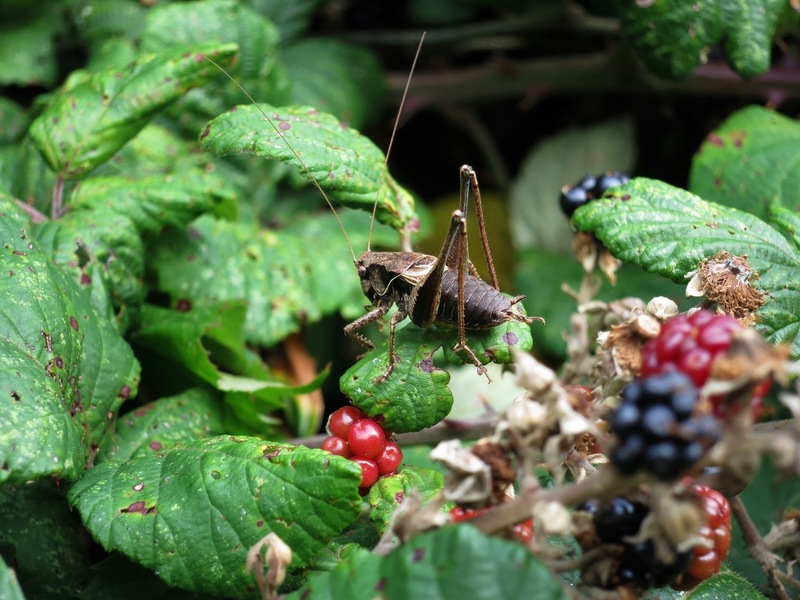 I came across a Dark Bush Cricket. There it was. Then it was gone. I was lucky it paused between leaps. Photography made me see them. I'd never noticed them before I started taking pictures of flowers. And once I'd seen them in their elegance and beauty and different-one-plant-from-another-ness, and the blobs of pollen on their ends . . . all that stuff, I've not been able to stop trying to take their pictures. Why this happens specially in autumn I don't know. Perhaps because of the light. Maybe it's a time when they show up well. Or maybe it's because the plants which flower at this time of year have especially prominent ones so they catch my attention. I always try to take photographs of Viper's Bugloss seeds - merely for the challenge. 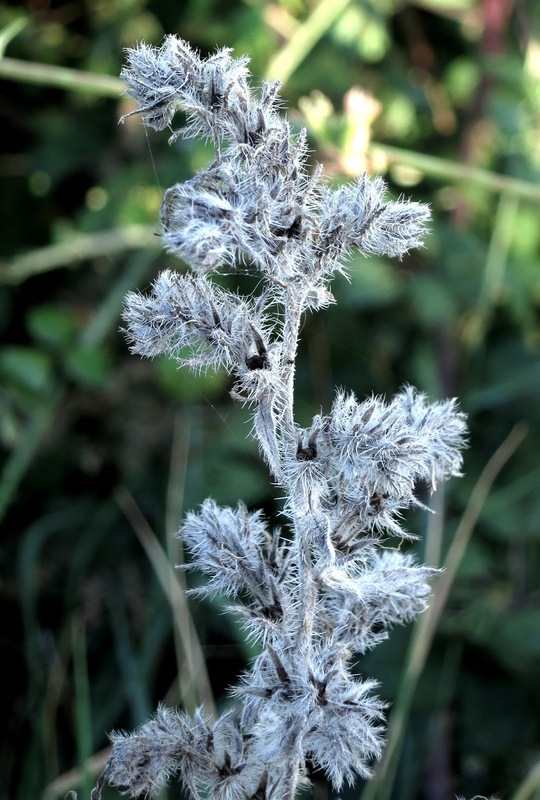 They are very tiny and they are held tightly within pale prickles which look like frost patterns. Every year I take a million photographs. Sometimes I'm lucky and one comes out all right. Mostly not. I haven't managed one this year yet. Maybe I won't. The seeds are already falling onto the earth. I realise most of the pictures in this post are set against inappropriate paragraphs. But I put them in order before I wrote the post and didn't get round to changing it. You'll cope! House and Garden Spiders (in Dutch.) It's a PDF illustrated chart so you can print it out. The Meaning of Latin Plant Names - on the Seed Site. It's short. It's fun. Try it. All photos were taken on September 25th 2014. As always I rely on iSpot for IDs. I reckon I can identify the Speckled Bush Cricket (Leptophyes punctatissima) but this is the first time I've come across a Dark Bush Cricket long enough to look at it. They don't 'arf boing so! Posts about these flowers from other years. Viper's Bugloss - This is a post from June 2012, not autumn. I know there are Viper's Bugloss seeds on this blog somewhere but I can't have labelled them so I haven't tracked them down yet. 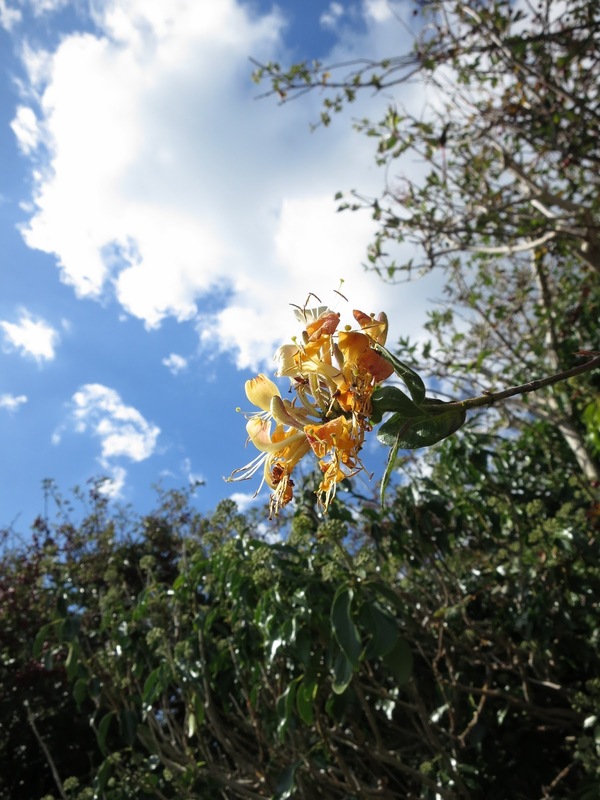 Honeysuckle - can't find honeysuckle on this blog. Bet there is some. Better labelling required! An enjoyable post, and interesting pictures. I like chicory flowers so grow it on the plot. Thanks Flighty. It's fund to explore more and more useful resources. Viper's bugloss to you, Paterson's Curse to me - so I weed it out when I notice the pretty purple flowers. But you're right the frost curled seedheads have a certain charm! Perhaps in November, certainly in December I'll be following my carob tree with delight. Ryland's Lane Allotment? Except that Buxton Road runs alongside it I've always thought it must be a wonderful allotment to garden in. It goes up and down. Sometimes really well kept. Sometimes a bit rugged. Last time I was there (about two years ago?) someone had put a great deal of effort into building a super-de-duper chicken house and run. Trying to work out the tense. is it that you used to have an allotment there and now don't or that you still have the allotment but the chicory has gone? Hello Diana. It's often the case that a weed in one place is a beautiful plant in another. Maybe it's good for plants to live in uncongenial conditions so they don't run riot. Beautiful photos and the Cricket is a great find. 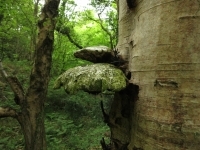 Although we revisit our favourite plants and places, they do change over the years, don't they? Roll on winter and a good clear-out! I have seasonal rituals too, the bluebell woods i always visit in spring, the snowdrop field I always visit in winter. Favourite trees for each season too, specially the hornbeams in autumn. I also like vipers bugloss, just yesterday i took a photo of it in full bloom surrounded by happy carder bees. I look forward to your observations of familiar sites...I do not see hawthorn trees or haws so i love when I see them through your eyes. I also have my ritual areas to visit and observe. Can you add my blog to your list of street plant bloggers? 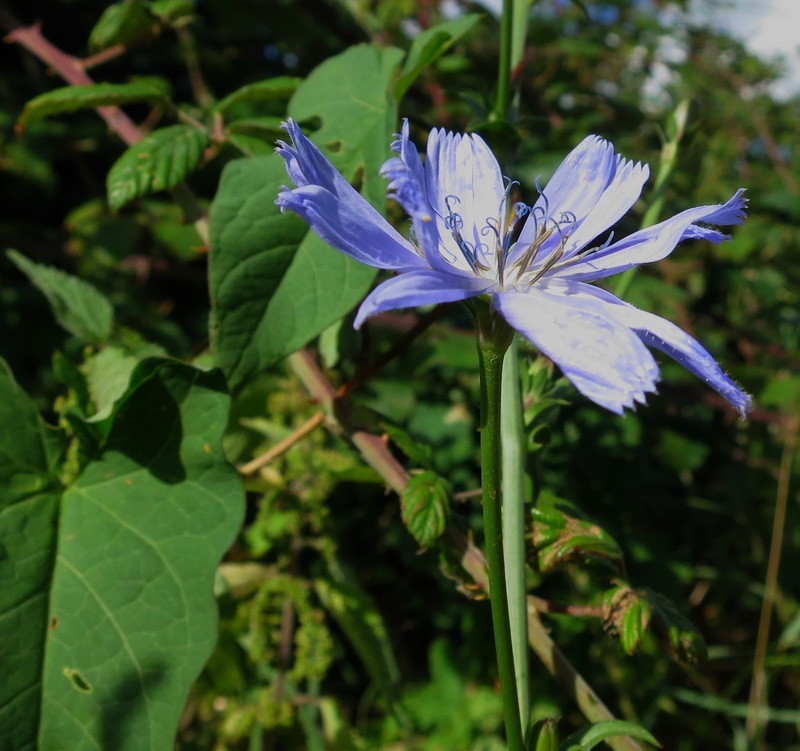 such an unexpected blue for Autumn is chickory. Love your 'stand and look' posts Lucy - there is nothing mundane about the ubiquitous when one looks with the right eyes!